The Minicom 0VS21002 is a CAT5 UTP VGA Splitter remote unit which simultaneously broadcasts, in real-time, video images to multiple remote screens. Using advanced CAT5 cable technology video images can be broadcast to distances of up to 110m/360ft. Cascaded it can broadcast to dozens of screens simultaneously. The CAT5 VGA Splitter is the best solution for places where there is a need for sharing of information, in real-time, at multiple locations. For example: corporate showrooms, banks/stock exchanges, trade shows, training centers, train/bus stations and airports. 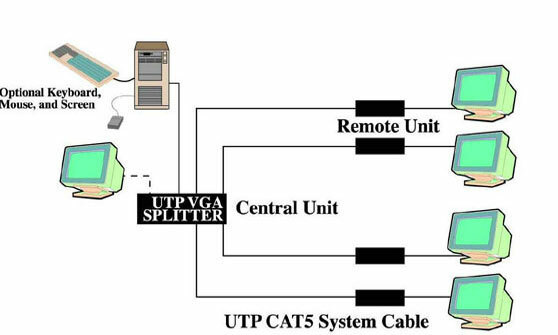 Note: The UTP VGA video splitter central units are sold separately.